Somebody on Facebook who read yesterday’s post wanted to know if their four-year-old cat was too old to learn tricks. The answer is no! Binga will be 16 in August and she can do tricks. Of course, she learned the Sit Up trick as a kitten, but she didn’t learn anything else until I came to live here. She walks on a leash and does High Fives, and she learned it all just from watching me do it. 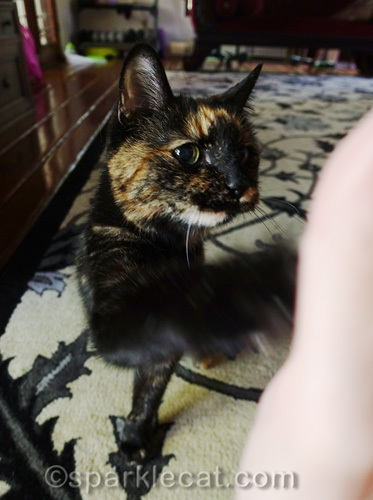 My human actually didn’t have to do anything — she just put her hand out for a high five one day and she did it! Of course, my human doesn’t do these tricks with her all that often. Usually Binga’s claws aren’t trimmed (she’s difficult), and sometimes she gets a little too, um, over-enthusiastic. Besides, how many humans want to get their hand too close to this face? She looks like a tricky tortie, and not in a good way! You think old cats cannot learn new tricks? Binga will whip out the WHAPPING PAW and use it. That will teach YOU something!!! My claws aren’t trimmed either. Binga and I have a lot in common. Torties are tricky ours is! Bing-Binga is so smart to learn tricks all on her own! Binga is just full of surprises. Aww, I’d high five her, claws and all! How cute that she’s learning from you, Summer! HAH! I think Binga is getting a bad rap here. I bite fingers but TW can hand feed me chicken and the don’t bite the finger that feeds me. We love Binga’s expressions! She must be a smart girl to learn high fives just by watching. Go Binga! Mother tried to get me to shake paws, but I would have none of it. Binga is a smart kitty, for sure! We love that she just learned from watching you! 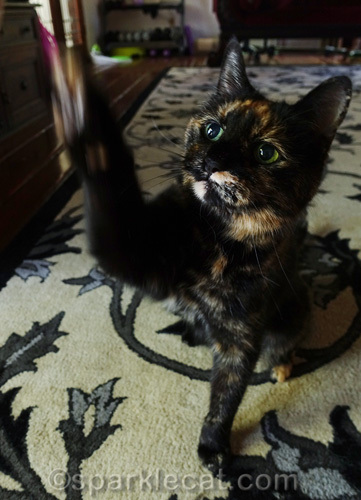 High five, Binga, from the torties here! Don’t worry Binga, you have plenty of torties to support you. Besides, torties have to keep up their street cred. Izzy is just barely an 8 month old tortie, and she aspires to be just like you when she is 16! We kitties are never too old to learn new tricks! Go Binga!!! Binga, we always love to see you! We can’t believe Binga is almost sixteen years old! You are such a cutie Binga!! Beautiful Binga, I think you get a bad rap! Way to go Binga! We knew you could do it! You’re looking extra beautiful this Tortie Tuesday! Binga is wonderful!!! We love torties!! Binga is so smart! And every time I see a photo of her I’m just amazed that she is 16 – she looks amazing! I think she has a painting of herself in the attic. Oh yeah, it takes nerve to risk THOSE pointy ends, for sure. Binga is preety darn smart, and cute too! Oh behind that facade is a sweet snuggly kitty our mama thinks. She wants to cuddle with Binga. Binga has just perfected the tortitude! Bingo, you are smart, beautiful and full of vigor. I love you. Binga is also a Pretty Cat! Binga’s definitely very pretty. I could use her advice on how to avoid claw clippings! I have my growl and MROOOOW! down, but my Momma’s too stubborn to let me go. I MIGHT consider tricks … especially if extra treats are involved. 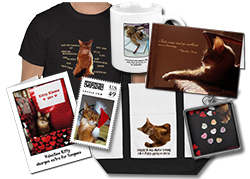 Binga ia a grrl cat after my own heart! Spunky and Smart! My mom will dare to do it ! Binga is an example of how the expression “copycat” came into being…the feline form of “monkey see, monkey do”. never too old to learn. i’d high five Binga anytime. Great answers Summer and WTG Binga 16…wow! Mom says cats can do ANYTHING they want to do…they just have to WANT to do it. She looks sweet to me. 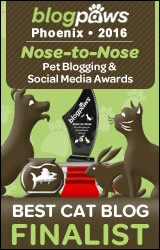 Way to go Binga, you were star of the blog today. You are a pretty darn smart girl to pick up those tricks from Summer. We like seeing you. We love Binga’s face and all her special markings. Love that devious, tortie glare!!!! Oh OUR tortie Sienna would be the same! At the moment she sticks to waking Mum up at 4 a.m……. Binga reminds us of our Tiger. Still, Binga is very cute! 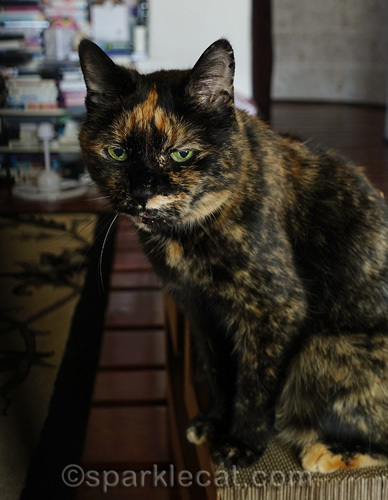 We think that Binga looks like a lovely tortie and #1 said she would love to give her a big smooch! And she’s clearly not just a pretty face either!